Cottonwood salve is an amazing medicine. February and early March are often the best time in the Pacific Northwest to collect the sap-filled buds of cottonwood trees for making an antiseptic, pain-relieving, skin-healing salve. The sweet-smelling sticky sap, also known as "Balm of Gilead", has been used for centuries to treat a variety of skin troubles, from cuts and scrapes to minor burns and bruises. Black Cottonwood trees (Populus balsamifera or trichocarpa) can be found growing along rivers and in moist forests. It grows very tall and has large heart-shaped leaves with small teeth. The bark is gray and smooth on young branches and the trunk becomes deeply furrowed with age. 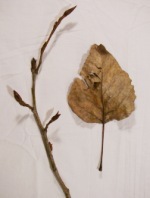 Cottonwoods are also known to drop branches. The tree holds so much water, that large branches often become so heavy that they break off and fall, especially in windstorms. After a stormy day you can usually find quite a few downed cottonwood branches, loaded with spring buds. Pick the buds that are large and swollen. They often glisten with sap and will break off from the branch easily. 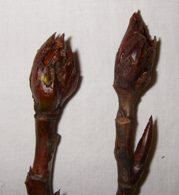 At this time of the year the aromatic sap is filling the buds. The sap contains a variety of medicinal components, including compounds that kill germs, ease pain, and promote skin regeneration. I often refer to the sap as the "skin ointment of the woods". In a pinch it can be used straight from the bud. 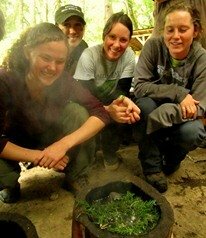 The difficulty in working with the sap directly is that it is extremely sticky (somewhat similar to pine sap). 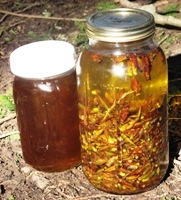 One of the best ways to extract the medicinal qualities of the sap is to infuse the buds in an oil. The oil can then be used as it is or turned into a cottonwood salve. To make cottonwood oil, fill a quart-sized glass jar about 2/3 of the way full with buds. Then fill the jar up to the top with olive oil (I prefer olive oil as it does not spoil easily). Put a lid on the jar and put the jar on a plate or bowl. Some oil often seeps out during the curing process. Let the jar of buds and oil sit for eight to twelve months. Stir every few weeks if you get the chance, and make sure the buds stay covered by the oil (exposed buds will mold). When you are ready you can strain the oil through a cheesecloth. It will have that characteristic sweet cottonwood scent. You can now use the oil directly on scrapes, bruises, and minor burns, or turn the oil into a salve. Now that you have created cottonwood oil, you can use the following recipe to create your very own medicinal salve. The advantages of a salve is that the medicine is turned into an ointment consistency that better adheres to skin and can be carried easily for first aid uses in the field. First, choose a pot or pan that you don't mind dedicating to salve-making, as the medicine will be very difficult to completely remove. Heat up your cottonwood oil on the stove on low heat. You can even use a double-boiler to further protect the oil from getting too hot, though it is not necessary. Once the oil has warmed up, slowly add the thin shavings of beeswax into the pot (a cheese grater can be used to shave a block of beeswax), waiting for shavings to melt before adding more. You can test the consistency of your medicine by removing a teaspoon of the heated oil/beeswax mix, and allowing it to fully cool. Your goal is to create an ointment consistency. Too little beeswax and the mixture remains as a thick oil, while too much beeswax turns the mix into a hard consistency similar to lip balm. You can adjust by adding more oil or beeswax to gain the desired consistency. Once you have melted your beeswax into the mix and achieved the desired consistency upon testing, you can allow the mix to begin to cool. Just before your salve begins to firm up, you can pour the warm salve into small containers such as baby food jars or small tins. Your salve will then cool down into place. The small containers of cottonwood salve make great gifts and additions to first aid kits. You can now use the salve to sooth sore muscles, treat minor burns and scrapes, and soften rough hands. Enjoy!